Iolo Williams has been a familiar face on our television screens for nearly 20 years but before that, he spent 15 years working for the Royal Society for the Protection of Birds in Wales. 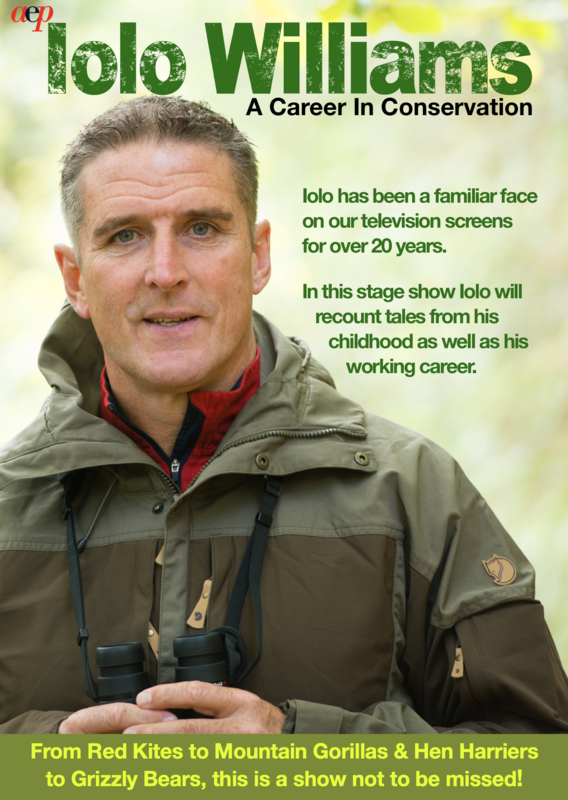 In ‘Iolo Williams, a career in conservation, Iolo will recount tales from his childhood as well as his working career. From red kites to mountain gorillas and hen harriers to grizzly bears, Iolo has been fortunate enough to work with them all as well encountering egg-collectors, pigeon fanciers and the SAS along the way. Iolo Williams was born in Builth Wells, and when he was 5 years old moved to the small village of Llanwddyn in north Powys. From a very early age, he wandered the moors, woods and rivers around his home in search of wildlife, often with the family dog, Bitw. Although not perhaps the best pupil in the world, he managed to attend school often enough to scrape A-levels in Biology and French before going on to study a degree in Ecology at the North East London Polytechnic. Upon leaving college, he returned to mid-Wales, initially working on a hill farm, then in the forestry, before starting work for the Royal Society for the Protection of Birds in 1985. His role as Species Officer for Wales entailed monitoring rare birds such as red kites, black grouse and chough, advising key landowners such as the Forestry Commission and National Trust, and investigating crimes against wild birds. The latter, in particular, brought him to the attention of the media and, threatened by a desk-bound management job in 1998, he left the RSPB to work in television and radio. Since then, he has presented wildlife and open air programmes in English and Welsh on BBC and S4C.